For the basics of Bayes Theorem, I recommend reading my short introductory book “Tell Me The Odds” It is available as a free PDF or as a Free Kindle Download, and only about 20 pages long, including a bunch of pictures. It will give you a great understanding of how to use Bayes Theorem. Bayes Theorem is a way of updating probability estimates as you get new data. You see which outcomes match your new data, discard all the other outcomes, and then scale the remaining outcomes until they are a full 100% probability. Medical Testing is a classic Bayes Theorem Problem. If you know 20% of students have chickenpox, and you test every student with a test that gives 70% true positive, 30% false negative when they have chickenpox and 75% true negative, 25% false positive when they don’t. Then before doing the test, you can construct a probability table of the 4 possible outcomes. When Is Bayes Theorem Used? The applications of Bayes Theorem are far ranging. It is commonly used in medical testing. For instance, you might make an initial estimate of your risk of heart disease based on the average rate of the disease in people your age, but then revise that risk once you receive new relevant information, such as your blood pressure or cholesterol results. Bayes Theorem has been used to locate lost airplanes, based on what search results have turned up. If you set a probability to zero, it will be zero forever. If you set it to a really low number, it can come back if a bunch of later observations indicate that you were in error to set it so low. For instance, instead of assuming a uniform probability distribution for the prior, a normal distribution might be a better approximation. These refinements are problem specific depending on what probability distribution best represents the problem at hand. More data is a great thing. Enough data can overwhelm any approximation you made in your initial estimation of probabilities (i.e. the prior) or in your likelihood calculation. This entry was posted in Uncategorized on October 7, 2017 by Fairly Nerdy. You more frequently see the normal curve plotted as a probability density function (i.e. the bell curve). But most of the time when you actually use it, such as to look up the probability of something being more than 2 standard deviations away from the mean by using a Z table, you are actually using the cumulative density function. To put it a different way, we more frequently care about the area under some section of the curve (the CDF at one location minus the CDF at another location) than the actual probability of any specific point on the curve. The chart below shows the binomial distribution of 20 trials with a 50% likelihood repeated, vs the normal distribution using the same mean and standard deviation. For instance, if we assume that a plant’s height is determined by 20 genes, and the genes the plant receives could be either tall genes or short genes, then the number of tall genes the plant gets is basically equivalent to saying how many heads will you get in 20 flips. It will follow the same distributions, which approaches the normal curve as the number of trials increases. The normal distribution uses standard deviations as a way of fitting itself to any set of data. The standard normal distribution assumes that the standard deviation of the data set is 1.0. You can either stretch / shrink the standard normal distribution to match your data, by multiplying it by the standard deviation, or you can shrink / stretch your data to match the standard normal distribution by dividing by the standard deviation. And see that 15.9% of the data is greater than 1 standard deviation to the left of the mean. There are lots of good references on how to use a Z table, including this youtube video. Level 2 Information – I recommend you get familiar with the basics of some of the other statistics topics before coming back and revisiting this in greater depth. Recall that the normal distribution can be generated as a series of binary events done an infinite number of times. The math of understanding binary events is the binomial distribution. One way to approximate the binomial distribution is a normal curve. This is because the binomial distribution is just the normal curve with a finite number of events instead of an infinite number of events. If I had an 80% chance of success in a single trial, and do 12 trials then I take the minimum of the odds of success (80%) or failure (20%). So this would be .2 * 12 = 2.4, so the normal curve would not be a good approximation of this binomial distribution. Skew is a way of measuring if the distribution is centered or not. A normal distribution is exactly symmetric. However, a probability distribution can also be skewed left or skewed right. This entry was posted in Uncategorized on September 30, 2017 by Fairly Nerdy. Hypothesis testing is a way of determining if some measured effect is a real difference, or likely just statistical noise. The baseline belief is always that any difference in measurements is just statistical randomness. We use the hypothesis testing equations to demonstrate that any measured differences are large enough that they are very unlikely to be merely random variations. When Is Hypothesis Testing Used? Hypothesis testing is used in scientific studies of all kinds to determine if an effect exists. This is synonymous with the term “Statistical Significance”. It is used, for instance, to show the difference between a real medicine and a placebo. This is also used in things such as A/B tests for advertising to determine which ads are most effective. Hypothesis testing always has two sets of measurements. (i.e. measure 10 samples from over here, and 15 samples from over there) Each of those two sets of measurements will have some average value. So there are always two averages. Those two averages will always have some difference between them. Sometimes the difference is very small. Sometimes the difference can be so small it is within the precision limits of the data and shows up as zero. Our default assumption is the “Null Hypothesis”. We assume that any difference in the average results is merely statistical noise until we show that to be more unlikely than a certain threshold. e. if we are confident that certain groups of people are stronger after a year spent lifting weights, that doesn’t tell us if the training actually caused the difference. It could have been something different like secret steroid usage. There are 5 different types of hypothesis tests, each with their own equations. However don’t get hung up on that yet, they are only small differences between all 5 of the tests. All hypothesis tests compare two sets of data. Call them the baseline set and the test set. Each of those two sets of data has 3 attributes, for a total of 6 attributes. This free PDF cheat sheet has the equations for the 5 different types of hypothesis tests, as well as an example of when you would use each one. Remember that we have a baseline set of data, and a test set of data. Each of those sets has an average, a standard deviation, and a number of measurements. Compared to the Z-test, T-tests have an additional equation, where you calculate the degrees of freedom. Degrees of freedom is just a way of determining how many overall measurements you have in your data set, which is used to determine how accurate your calculated standard deviation likely is. I’ve put together an example of each of the different types of hypothesis test as a kindle book, here. That’s it for the first block of information. If you work through a couple of examples and understand most of those points you will have a good grasp of hypothesis testing. I recommend coming back and learning this second section in a few days or a week. What is the difference between a T-Distribution and a Z distribution? The point of having any distribution at all is that there is a range of values that your average could be. e. having a normal distribution accounts for the fact that you don’t know your average exactly. But you also don’t know the standard deviation of your data exactly. A Z distribution uses a normal curve and ignores any uncertainty in your standard deviation. This is because it assumes you have enough data that your standard deviation is quite accurate. It based the shape of the curve on the degrees of freedom, which is a way of calculating how many measurements you have. Truthfully, in many cases, you aren’t going to get very much difference no matter which of these equations you use. Some of the equations pretty much reduce into the other equations as you get more and more information, i.e. if you measure at least 30-50 data points the difference between the 1 sample T-test and the Z test is pretty small. It turns out that many of the equations for the 5 different hypothesis tests are just simplifications of each other. They can be morphed into each other as you make assumptions, such as that the number of measurements goes to infinity for one of the datasets. Blog post on this to be done. This entry was posted in Uncategorized on September 18, 2017 by Fairly Nerdy. This section of the website covers statistics and has most of the same topics that would be covered in a statistics 101 course at a University. Here is the table of contents for the different statistics topics covered on this site. Another great resource for statistics help is Cross Validated. There you can ask questions about your specific problems and get help. The reason I wrote this material came from my own pursuit of the same information. I am about 10 years removed from studying aerospace engineering in college and have been working as a professional engineer since then. However, even though I studied statistics at the university, a lot of the concepts proved to be slippery and a “use them or forget them”. This is especially true of things I knew mostly by memorizing equations. Remembering equations worked fine for carrying me through a semester of school, but to remember the topic for a whole career or a lifetime, it turns out that I needed something different. I needed to find ways relate each topic other things that I knew, so it wasn’t on the periphery of my knowledge anymore, but deeply ingrained. These topics are my attempt to cover statistics in a way that is easy to learn and remember long term. A lot of this material I re-learned through self-study. Being largely self-taught in these topics often makes it easier for me to find relatable examples for other learners than it would be for the complete expert. The downside of self-study is that it can leave gaps. For instance, when learning how to do multiple linear regression (i.e. draw a straight line/plane/hyperplane through data that has at least 2 independent variables) I ran across a method of doing it that was an intuitive but laborious expansion of simple linear regression. A reader who is more of an expert than I pointed out that I had missed a simple to do (but difficult to understand) method of doing multiple regression (i.e. Moore-Penrose pseudo inverse). Rather than diving deeply into specific topics before moving on. The internet has a lot of great content on it, and it doesn’t make sense to duplicate a bunch of material that already exists. So when I know of pages that have great explanations or find useful tools, I will link to them. And if you have suggestions please let me know. I have also covered some of the other topics in more depth as Kindle Books (typically priced under 3 dollars), so I will link to that material where it makes sense. I know that some people can’t access the Kindle content or are not in a position to purchase it, so I would be happy to send a free PDF copy if you contact me. This entry was posted in Uncategorized on September 16, 2017 by Fairly Nerdy. The purpose of this blog post is to provide an intuitive understanding of why statistical significance works the way it does. The most important concept for that is to understand why small differences in measured results become more statistically significant as you get more measurements. And the reason for this is that the standard deviation of the mean decreases significantly as you get more measurements, even if the standard deviation of the population doesn’t change at all. When you are testing for statistical significance, the equation you are asking is, how unlikely would this outcome have been if it just happened by random chance? You are likely aware that most real life events have some degree of scatter in the results. If you take a bunch of measurements for similar things you will get some measurements that are high, some that are low, and some that fall in the middle. For instance, if you are buying a prepackaged 5 lbs. bag of apples at the grocery store, and you weigh all 20 bags of apples that are on the shelf at the time, you will likely see some that are around 5 lbs., some that are 5.1 lbs, some that are 5.2 lbs, and maybe even a couple that are 4.9 lbs. You might come in one day and measure 10 bags of apples and find that the average weight of those 10 bags is 5.2 lbs. You might come in a couple of months later and measure 10 different bags and find that the average weight of those bags is 5.0 lbs. Does that change in results mean that something changed to cause the new bags to be lighter? For instance, maybe the apple packers are using more accurate machines to make sure all the weights are barely above the guaranteed 5 lbs. Or maybe that change in results is just a random outcome of the particular bags you chose to measure on that particular day. Statistical Significance is a way of determining which of those possibilities is true. What we are doing with statistical significance calculations is determining how unlikely an outcome was to occur by random chance, and then deciding if that probability is unlikely enough that we can conclude something other than random chance caused that outcome. The two most important things in a statistical significance calculation are the distance the average value of your measured data is from what you are comparing it against, and the standard deviation of what you are measuring. It is easy to understand how the difference in measurements is important. For instance, in the apple example, if my first group of apples weigh 7 lbs. and the second group weigh 5.0 lbs. there is more likely to be a significant difference than if my first group weigh 5.2 lbs. and my second group weigh 5.1 lbs. The greater the difference in measurements, the greater the significance, assuming that all other values are equal. Standard deviation is the second important topic in calculating statistical significance. It is worth going over how the standard deviation works. Standard deviation is a way of measuring how spread out your measured values are. If the values you are measuring are all clustered together, they will have a low standard deviation. If they have a lot of variation in the measurements, they will have a high standard deviation. For example, if you had measured 5 bags of apples and their weights were 5.0, 5.1, 5.1, 5.2, and 5.2 lbs, those results are a lot more tightly clustered, and hence lower standard deviation, than if you had measured 5 bags and gotten weights of 5.0, 5.6, 5.9, 6.2, 6.5 lbs. The image below shows what we typically think of when we think about standard deviation. There is a mean value at the center of a normal curve. If you make another measurement of the same type of data it will fall somewhere on that normal curve, with decreasing likelihood the farther you get away from the mean value. So if we know the mean value and standard deviation of our data, we know the distribution of results that we expect to get. We know that if we get a result that is 2 standard deviations away from the mean, that it is a rare event because 95% of the results will fall within 2 standard deviations of the mean. With hypothesis testing, what we are doing is turning that chart around and asking the question in reverse. Now what we are doing is putting a normal curve around our measured data, and asking the question “How likely is it that this measured data came from the same source as the reference data?” We are asking how many standard deviations the reference value is from our mean value. This is shown in the chart below. Now, this might seem like it was a useless distinction. If the reference value was two standard deviations away from the measured value, then the measured value will be two standard deviations away from the reference value. That is completely true, but only if we only have a single piece of measured data. The one piece of information that you can’t figure out just using a typical normal curve is what to do with additional measurements. Let’s say that you have a mean and standard deviation for a set of data. For instance, maybe the bags of apples on week weigh 5.2 lbs on average and have a standard deviation of 0.2 lbs. If you go back to the store a month later and weigh a bag of apples that is 2 standard deviations heavier, at 5.6 lbs. you will think that is unusual because a 2 standard deviation difference is a rare event. But what if your next measurement is 5.4 lbs, and your next one after that is 5.1 lbs.? Do the additional measurements make you more or less convinced that the new bags of apples are different than the old bags? The effect of increased quantity of measurements is the single most important concept in understanding statistical significance. If you understand this, then you understand statistical significance. The rest of it is just knowing when to apply which equation. The concept is this: We do not care about the standard deviation of our data. What we care about is the standard deviation of the mean value of all of our measurements. And that standard deviation of the average can change as you make additional measurements. Why Does The Standard Deviation Of The Mean Decrease With More Measurements? We stated that what we are interested in is the standard deviation of the mean value of all of the measurements we make. The standard deviation of that average value decreases as you increase the number of measurements made. Why is that? Fortunately, we don’t have to use complicated math to explain this topic. You have almost certainly seen it before, although you probably didn’t think about it in these terms. The way to understand the standard deviation of the average result is to think about what happens when you roll a single die vs what happens when you roll 2 die or more dice. If you roll a single die, you are equally likely to get a 1, 2, 3, 4, 5, or 6. Each value will come up one-sixth of the time, so the probability distribution of a single die rolled six times will have each value coming up one time. There is no way to predict the outcome of a single die roll. No outcome is more likely than any other. Now, what happens if you roll two dice, and add their values? Well, there are 36 different permutations of die rolls that you can get out of two dice, 6 values from the first die, multiplied by 6 values from the second die. However, there are only 11 different sums that you can get from those two dice, the values of 2 through 12. Those 36 different die permutations don’t map evenly onto the 11 different possible sums. You are more likely to get values in the middle of the range than values on the edges. The probability distribution of the sum of two dice is shown below. For our purposes, the key point is that the probability of outcomes is more concentrated in the center of the graph for two die rolls than it is for a single die roll. That concentration of probability into the center of the graph doesn’t stop with 2 dice. If you sum the value of 3 dice there are 216 different permutations of rolls (6 * 6 * 6) mapped onto 16 possible values (3-18). The probability distribution for 3 dice summed is shown below. Even though it isn’t quite as visually obvious as going from 1 die to 2 dice, summing 3 dice has a greater concentration of probability in the center of the graph than the sum of 2 dice. That process would continue if we kept rolling additional dice. So far with these dice, we’ve talked about the sum of the dice values. Now let’s talk about the average value. To calculate the average value, just take the sum and divide by the number of dice. So for instance, if you rolled a sum of 7 on 2 dice, then your average value was 3.5. The probability distribution of the average value for 1, 2, and 3 dice rolled is shown in the plot below. Why Is This Important For Statistical Significance? Let’s pause for a second and reiterate why we care about the above result, in terms of statistical significance. What we see is that by making multiple measurements, we can be more confident in their average value than we can in the result of any single measurement. The range of possible outcomes for the average of all measurements is the same as the range of possible outcomes for a single measurement, but the distribution over that range is a lot more clustered in the center. What we are seeing is that the standard deviation of the mean of multiple measurements is lower than the standard deviation of a single measurement. Since statistical significance is about the number of standard deviations outside of the mean value your results are, this is very important. It might be surprising that the probability for every single possible average for 3 dice is lower than their counterpart for 2 dice, and also for 1 die. That is because as you increase the number of dice, the probability is spread among more possible outcomes. There are only 6 possible outcomes with 1 die, but 11 possible outcomes with 2 die and 16 possible outcomes with 3 die. In order to get consistent probability distributions with different numbers of dice, we can use a histogram and ‘binning’ to make sure the probability is spread among the same number of outcomes. That wouldn’t plot very well for 1, 2 and 3 dice; however here is a binned result of the probability distribution for the average roll when rolling 5, 10, and 20 dice. As you can see, the greater the number of rolls, the more the probability distribution of the average value is clustered around the average value of 3.5 and less at the edges. This means that the standard deviation of the average is decreasing as you increase the number of samples used to calculate it. We can, in fact, calculate the standard deviation of the average for a given number of dice. For a single die, this is just the population standard deviation of [1, 2, 3, 4, 5, 6], which is 1.7078. For two dice, it would be the population standard deviation of the 36 possible average values (11 distinct values) of [1, 1.5, 1.5, 2, 2, 2, 2.5, 2.5, 2.5, 2.5, 3, 3, 3, 3, 3, 3.5, 3.5, 3.5, 3.5, 3.5, 3.5, 4, 4, 4, 4, 4, 4.5, 4.5, 4.5, 4.5, 5, 5, 5, 5.5, 5.5, 6], which is 1.207615. Fortunately, there are more efficient ways to calculate the standard deviation than listing out every single value (by using a weighted average of the squared difference from the mean). When you calculate the standard deviation of the average for all numbers of dice between 1 and 20, you get the plot below. As expected, we see that the standard deviation of the average continues to drop as we increase the number of samples. The other notable thing about this plot is that the rate of change begins to level off. Adding a few more dice drastically decreased the standard deviation of the average at the beginning, but it takes a greater and greater number of dice to get the same amount of change. In practical terms, what this means for statistical significance is that there is a diminishing return to getting more data to use in your statistical significance calculation. At the beginning additional data will make a large change, however, eventually, the cost of acquiring additional data will outweigh the benefit. The plot below is the same as the plot above, except with a regression curve fit on the data. Although it varies slightly depending on the problem in question, that sigma and the square root of n appear in pretty much every variation of the statistical significance equations. What they are demonstrating is that the standard deviation of the average of the samples is the standard deviation of the samples (sigma) divided by the square root of the number of samples. Or to put it another way, as you increase the number of samples, the resulting average of your measurements is increasingly likely to be close to the true population average, just like we saw with the dice rolling. As you can see, the sigma divided by the square root of n that we saw as we measured the average roll of an increasing number of dice is a key part of the equation. This entry was posted in Uncategorized on March 12, 2017 by Fairly Nerdy. The binomial equation calculates the probability of getting a certain outcome after a number of discrete events. For instance, if your team has a 60% chance of winning any single game against another team, what are the odds that they will win at least 4 out of 7 games in the championship series against that other team? Now let’s say that you have two different outcomes, A and B. What is the probability that outcome A will occur A times in a row, and then outcome B will occur B times in a row? This is just the probability of A, raised to the power of A times, multiplied by the probability of B, raised to the power of B times. For instance, if you wanted to calculate the odds of rolling a die 5 times in a row and getting 6 every time, and then flipping a coin 4 times in a row and getting heads every time it would just be 1/6 raised to the 5th power, multiplied by 1/2 raised to the 4th power. That is simple enough, easy to understand, and frankly you don’t need a special equation in order to remember it. And that is the second half of the binomial equation. Ok, that is the second half of the equation with the exponentials, what about the first half of the equation? This is the combination equation. There are a lot of interesting things to know about the combination equation, and those are discussed in this blog post on combinations and permutations. For our purposes right now, the best way to think of this part of the equation is as such: It is the number of different orders of ways you can do outcome A and outcome B. i.e. it is the number of different tries you get at making your desired outcome happen. And so on. There are in fact 6 unique orderings of 2 rolls and 2 flips. This can be calculated by 4! / (2!*2!) = 24 / (2*2) = 6 here the 4! Is because the total number of events is 4 (2+2) and each of the two factorial is because there are two trials of event A, and two trials of event B.
Let’s take it back to the starting example. Your team has a 60% chance of winning. What are the odds they will win exactly 4 games in 7 ? Outcome B is that the other team wins. This occurs 3 times and has a probability of .4. So the odds of your team winning exactly 4 games are 29.03%. What Are The Odds Of At Least 4 Games? The end result is that if your team has a 60% chance of winning any single game, you expect that they have a 71.02% chance of winning at least 4 games in a 7 game series. If you increased the number of games, and went best 5 of 9, or best 6 of 11 the likelihood of the team with the higher winning percentage winning the series increases. There is another reason why I like the binomial equation rewritten the way we did it. That is because it is easy to expand that equation from a Binomial equation to a Multinomial equation. I.e. it is easy to change from 2 outcomes to 3 or more outcomes. What would be a multinomial event? Well for instance, instead of having two teams play, think of three people racing in a track meet. So instead of calculating the odds of one team winning 4 games out of 7, what are the odds that person A will win 4 races out of 7, person B will win 2 races out of 7, and person C will win one? Here assume the odds of person A, B, and C winning any given race are 50%, 40%, and 10% respectively. Once again, the second half of the equation is the probability that that specific chain of outcomes will occur, and the first half of the equation is the number of different paths you can take to get there. Thanks for reading this post. Please comment if there is anything not clear. I’ve also written a longer Kindle book on this topic that has a number of more examples that you can find here. This entry was posted in Uncategorized on January 9, 2017 by Fairly Nerdy. What Is The Time Complexity Of Dynamic Programming Problems ? I always find dynamic programming problems interesting. Find a way to use something that you already know to save you from having to calculate things over and over again, and you save substantial computing time. But just how much computing time are you saving ? One of the classic questions that you will get on any programming interview is “What is the time and space complexity of your problem?” Which means, if you start ramping up the size of the problem with bigger numbers, will the solution get a lot slower really fast, or will it take really large numbers before the solution takes too long to be practical. The classic way of doing dynamic programming is to use memoization. Memoization (which looks a lot like memorization, but isn’t) means to store intermediate answers for later use. You are increasing the amount of space that the program takes, but making the program run more quickly because you don’t have to calculate the same answer repeatedly. The rest of this post goes through an example memoization program to show how it works and build an intuitive understanding of the time/space complexity. But if you are already familiar with those type of problems and just want the answer, it is that the time and space complexity of dynamic programming problems solved using recursive memoization are nearly always equal to each other. And they are equal to solving every sub-problem exactly one time. So if you figure out the maximum number of sub-problems, that is your solution. A lot of these problems can be represented on a 2 dimensional graph, so the time complexity to fill every square in the graph is N * M. However that there are problems that are multi-dimensional (3, 4 or more dimensions), or take additional time complexity to solve a single square, so the N * M is not a generic answer. An Example Dynamic Programming Problem. You have a set of coins of different denominations. You have infinite quantities of each of the denominations. You also have an amount of money to make change for. How many different unique combinations of coins can you use to make exact change? For example, if you are making change for 4 cents with coins valued 1 and 2 cents, [1, 1, 1, 1] is unique from [1,1,2] and is unique from [2,2]. However [1,1,2] is not unique from [2,1,1]. So the solution to this small example is 3 unique ways to make change. More importantly for this blog post the question is, when this problem is solved for an arbitrary number of coins and an arbitrary amount to make change for, what is the time and space complexity of that solution, and how can it be generalized. Here is a larger example to see how we can solve this problem with a recursive algorithm. For this example, assume that you have that you have 6 cents, and can make change in the denominations 1 cent, 2 cents, or 5 cents. The recursive solution to this problem is to call the function repeatedly and each time branch into two more calls. On one branch subtract the largest coin from the amount remaining to make change from. On the other branch remove the largest coin from the list of available coins used to make change. If you run out of coins or get negative change, then that branch is null. If you end up with exactly zero money remaining, that is a solution to count. In this chart we can see a lot fewer branches, because we re-used some of the data that we had previously computed. Clearly the memoization saved work, since we saved re-computing several sub-problems. So how many sub-problems did we have to solve? The answer is we had to potentially solve for every quantity of our money value (N), and every count of the number of counts we have (M). This means that the solution will take N*M time. And this highlights the key to the solution to the memoization time / space complexity. For all of these type of problems you generally have to, at least potentially, solve every sub-problem, but you will only have to do it one time. Then you can save the result to use later. The other good way to remember how much time / memory you need to solve a recursive memoization problem is to realize that the recursion is a top-down solution. However you are solving the exact same problem as if you built the table from the bottom up. Nearly all of these type of dynamic programming problems have a bottom up solution. ( In fact I’ve never encountered on that couldn’t be solved bottom up, but they probably do exist) Often times the bottom up solution is more difficult algorithmically, but it is easier to realize how much time and space it needs. If you want to solve the coin change problem yourself, here is some sample input. Note, these all solved nearly instantaneously on my computer with memoization in place. without memoization, Example 3 will probably freeze your computer. You can download the python code I used to solve this problem here (as a zip file). This entry was posted in Uncategorized on October 13, 2016 by Fairly Nerdy. How Much Should You Bet In A Game That Favors You ? Here is an interesting problem. I’m going to lay out a favorable bet. You will have the opportunity to place a bet multiple times, and resolve each one before moving onto the next one. How much should you bet each time so that the you whose luck is exactly average will win the most money ? You start with 100 dollars. We will flip a fair coin, and if it is heads, you win. If you win, you double the amount of money that you bet. If you lose you lose half of the money that you bet. e. if you bet the full 100 dollars you started with, and you win you have 200 dollars, and if you lose you have 50 dollars. You can play this game up to 100 times. Now clearly this is a favorable bet. On the first bet, if you bet 100 dollars, you have a 50/50 chance of winning vs losing. 50 percent of 200 dollars plus 50 percent of 50 dollars means the expected value of that bet is 125 dollars, for a gain of 25 dollars. However just as clearly if you place that bet 100 times you are just as likely to win as many bets as you are to lose those bets. So if you bet all your money each time, then times that you get lucky and win more times than you lose, for instance win 56 times and lose 44 times, you will win a lot of money. However the person whose luck is exactly average will win 50 times and double their money, and lose 50 times and cut their money in half, and leave with the same 100 dollars they started with. We want that average lucky person to win the most money possible, so how much should you bet ? To simulate that I ran a python program through a couple million people betting different percentages of their bankroll. You can download that python program, the one that generated the charts below, and the associated Excel file here. This chart shows how much money the 50th percentile person would have depending on how much they bet as a percentage of their bankroll. So if you knew that you were going to win exactly 50% of your bets, your optimal bet amount exactly half of your bankroll each time. Even though you were in the 90th percentile of luck, betting all your money each time would be a mistake. If you knew that you were going to win exactly 56 of your 100 bets, your optimal bet size would be 68% of your bankroll each time. So betting more money on a positive expected value game can increase your net expected value, but it would come at an increased risk if you don’t run lucky. Let’s say that you had a game where you would win or lose your bet, but that the odds of winning were 55% and you only had a 45% chance of losing. i.e. imagine that you were betting on red or black on a game of roulette, except that the color distribution favored you instead of the casino. You have the opportunity place this bet 100 times. As it turns out, the best amount to bet here is 10% of your bankroll each time. That 10% number is suspiciously the same as the amount of advantage that you have in the game, i.e. the difference between 55% win rate and 45% loss rate. We see that the best bet amount for 60% is to bet 20% of your bankroll, and the best bet amount for a 65% win rate is to bet 30% of your bankroll. It turns out that the best bet is exactly the advantage that you have in the game. It turns out that this optimal amount to bet was first discovered in 1956, and is known as the “Kelly Criterion”. This was named after John Larry Kelly, who was an associate of the famous Claude Shannon, who went on to use this formula as well as other mathematical techniques to make a substantial amount of money in the casinos and in Wall Street. And f* is calculated to be .25 = 25% of our bankroll as the optimal bet. Now the graph indicated that we should be betting 50% of the bankroll. However since we could only lose half of that 50% of the bankroll in the double or half bet, that is equivalent to betting 25% of the bankroll when using the same terminology as the Kelly Criterion. Which shows that we should be betting 20% of the bankroll for the 60% chance of winning case, which is exactly the same as the python code determined. For most real world scenarios, where you are betting against the house which has a house edge, f* becomes negative, which means that you shouldn’t be playing that game. Truthfully it means that you should take the other side of the wager, become the house, and make them bet against you! This entry was posted in Uncategorized on March 26, 2016 by Fairly Nerdy. People have come up with many different betting systems over the years. One of these, the Martingale betting system, is interesting because it illustrates how a high level understanding of a concept can be insufficient. I will start by betting some small amount on a wager that is as close to 50/50 as I can get. So assume I’m betting $1 on a coin flip. What the bettor appears to have is a system that guarantees them small winnings. They will steadily be winning the 1 dollar net bets. Clearly this is not the case, from Gambler’s Ruin we know that you cannot win any negative expected value game long term. So the Martingale system is not a betting system that you should use. But why is it bad? There is a surface issue, and an underlying math issue. The underlying math issue is more interesting. It boils down to the fact that you cannot keep doubling your bet forever. At some point you hit either the limit of your bankroll, or the house limit. And in any finite money scenario, all you have done is set up a situation where you frequently win a little bit of money, but infrequently lose a lot of money. So how does that work ? Let’s give an example with different amounts of bankroll. Let’s say that you have 7 dollars total. This means that you can keep betting up to the 4 dollar limit, and if you lose the 4 dollar bet you will have lost everything. That gives you a total of 3 bets, at 1, 2, 4, before you lost. How likely is this to happen ? If you play this game 8 times, then 7 times you will win 1 dollar, and one time you will lose 7 dollars. The net expected value from this is zero, which is exactly what you would expect since you are assuming a 50/50 game. If you have 63 dollars, you can run through it and find that you have a 1 in 64 chance of losing the 63 dollars, and a 63 in 64 chance of winning 1 on any give series of bets. Assuming 50/50 odds, and that you have a power of 2 bankroll, your chance of going broke is exactly equivalent to your bankroll. Do you have a 1023 dollar bankroll? Then you will go broke 1 in 1024 times. Do you have a 4095 dollar bankroll? You will go broke 1 in 4096 series of bets. Which can be calculated from the binomial distribution. Doing that betting strategy, the “Normal” strategy of betting the same amount every time would give you practically zero chance of losing all your money after 64 bets. If instead you went with the bet doubling strategy, and placed 64 strings of bets this is what the probability curve would look like. The total expected value of that chart, which is the cumulative probability multiplied by net winnings, is zero. 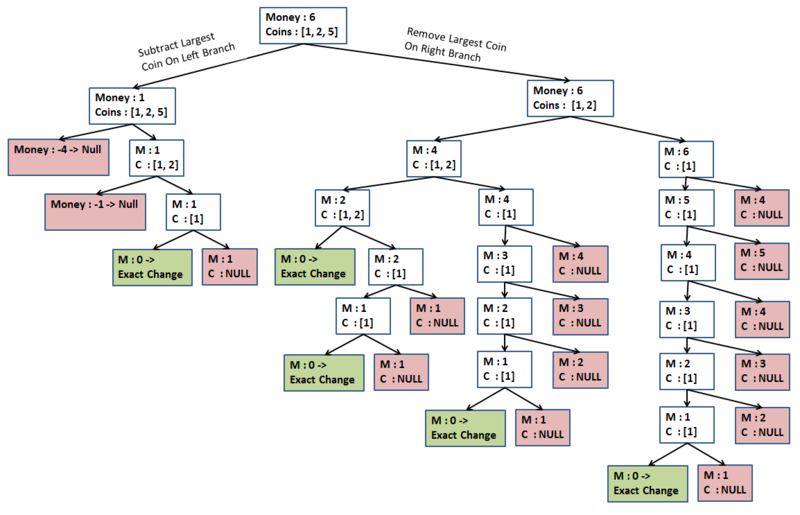 So while Martingale strategy of doubling the bet strategy isn’t a surefire winning technique, it does change the outcome so that instead of being likely to win or lose a little bit, you are most likely to win or lose a lot. This entry was posted in Uncategorized on March 17, 2016 by Fairly Nerdy.